David Alon first surveyed the site, located on a strategic plateau looking over the Beer Sheva valley, in the early 1950s. Excavations from 1979 to 1987 were conducted, first by the Israel Department of Antiquities, and then by Tel Aviv University and the NGSBA. The sites Biblical identification is unknown. Nine strata were identified, dating from the 27th century BCE to the early Arab period 8th century CE. The richest finds came from the Iron Age and Byzantine periods. 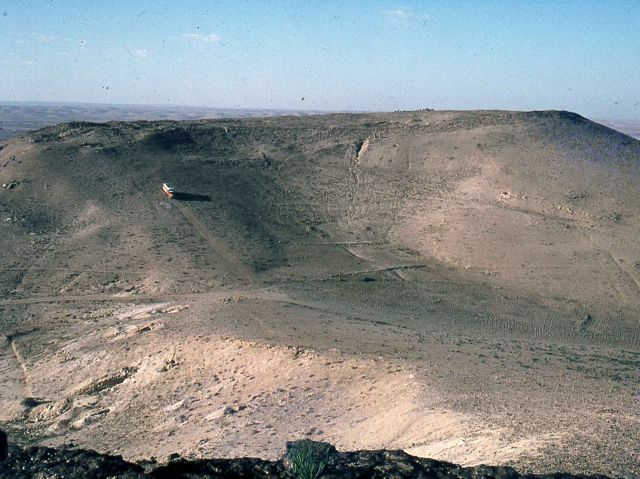 Although seven areas were excavated, the area uncovered is less than 1/20th of the total area of the tel. In the Iron Age II, the site was fortified by a new city wall over 5m thick. In the eastern section of the tel, portions of a city gate and some public buildings were uncovered. A cemetery at the foot of the eastern slope consisted of 25 tombs hewn into the bedrock. Most were robbed in antiquity. Beit-Arieh, I. (ed.). 1999. Tel ‘Ira – A Stronghold in the Biblical Negev. (Monograph Series of the Institute of Archaeology, Tel-Aviv University, No. 15). Tel-Aviv: Tel Aviv University.